Why Trust All Stripped to assist in your renovation? Having removed over 320,000m2 tiles, and another 472,000m2 combined of timber, cork, vinyl, carpet and other surfaces (about 3600 times the size of an average house), plus stripping more than 7650 bathrooms and kitchens; you can rest assured we have successfully dealt with all possible situations. No job has ever proven too difficult for us to handle. We are the most recommended strippers in the country by floor laying professionals, builders and renovators because they know they can rely on our experience, customised equipment and industry knowledge to produce the best possible job every time. Saving time and saving you money. With over 98.7% domestic jobs completed within one day, we aim to minimise the disruption to you and your family. Make no mistake; this is a dirty and dusty job. By using industrial dust extraction where possible, removing all rubble from the site and completing a full and thorough cleanup – sweep, vacuum and dust – we are regularly praised for how clean we leave a site. Feel safe and secure knowing that you are dealing with professionals who really are the tile and floor removal specialists. You will find us easy to work with, very friendly and helpful. 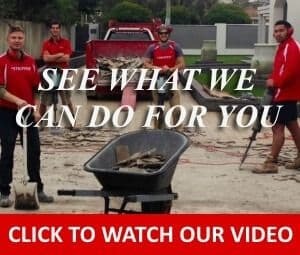 We are fully insured against all possibilities, we will turn up on time, complete the job efficiently and effectively, take away all rubble and complete a full clean up before we leave.